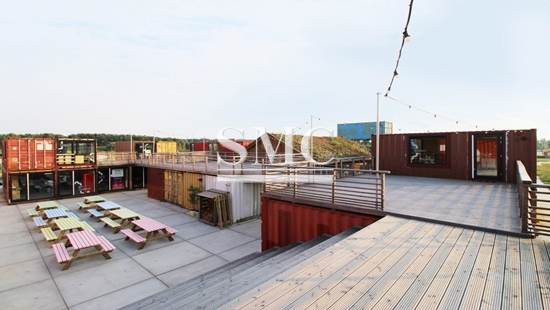 Dutch Architect Julius Thaminiau has designed a startup hub primarily made of shipping containers in Amsterdam’s Science Park. Shipping containers are popular in the current architecture scene, because of their portable, stackable, and widely available qualities. Julius Thaminiau was inspired by the idea of turning an abandoned plot of land into a low budget workspace for startup companies. "The shipping container as a metaphor for a garage in which a lot of big companies had their first office, like Apple and Microsoft," the architect said in his statement. "By placing all these 'garages' next to each other a dynamic village arises. The startups will inspire, collaborate across sectors, exchange knowledge and produce unexpected and paradigm-shifting creations." The Startup Village has two floors, and includes a meeting room, event space, labs, workshop spaces, and working spaces. The container offices are insulated, have glazed fronts, openable rear windows, high speed internet, low energy heating, and natural ventilation. The village has a central square for open-air events, while the covered event space is used for indoor events. The village also has several coffee spaces to increase the rate of encounters and interaction between workers. "The shipping containers can be clad and placed in many different ways, which makes the shipping container quite an interesting architectural element to build quick and low-cost sculptural and spatial temporary building," explained Taminiau. Start-up companies can choose from the smaller 6-metre-long containers, a set of connected 6-metre containers, or a larger 12-metre container. All of the containers are lockable, making them cheap and low impact office spaces. At Shanghai Metal Corporation, we offer the best quality shipping containers to suit whatever creative or practical need you may have. We offer ISO Standard Containers, Equipment Containers, Storage Containers, Reefer/Insulated Containers, and of course Container Houses. Our container houses include solar panels used for indoor electricity and water heating, and discharged and purified living water. We personalize our containers to every customer’s individual need. For your container needs, look no further than SMC. For more information including specifications and price, please click here.